The Bybee Golden Goddess 'Super Effect' Speaker Bullets have been praised by audio reviewers and customers as the most sonically powerful of all plug-in Bybee accessories. Those plug-in Speaker Bullets are still available (by special order), for users who want the flexibility of transferring them to different loudspeakers, at the retail price of $4,200 (per set of 4), with two sets required for bi-wire loudspeakers. However, Jack Bybee has recently created a more affordable version: The Bybee Speaker Bullets ($740 per set) an equally high-performance alternative to the plug-in product. The Bybee Internal Speaker Bullet Kit was designed for OEM loudspeaker manufacturers, and people like you- someone who isn't afraid to roll up your sleeves, dig-inside the speaker cabinet and fire up the soldering iron! The Bybee Speaker Bullets are installed internally (hence, the name), and placed after the speaker binding posts, but BEFORE the crossover network. 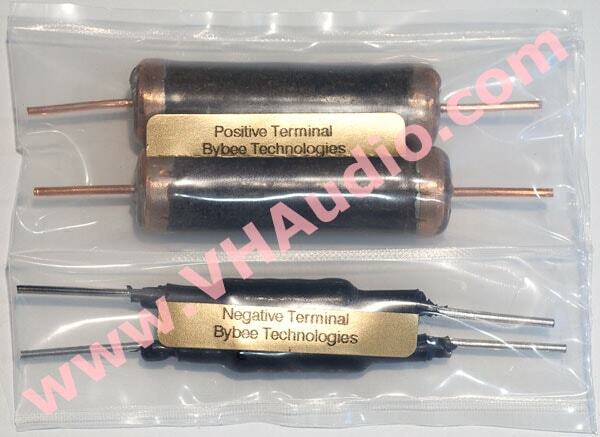 Each Bybee Internal Speaker Bullet Kit contains two Positive and two Negative devices. The Positive element is a custom-fabricated 'Super Effect' Internal Purifier with one-inch leads. The Negative element is optimized for maximum sonic performance and quieting on the return leg of the connection. One Bybee Internal Speaker Bullet Kit treats a pair of single-wired loudspeakers. Bi-wired speakers require two Kits. For the audiophile who demands the absolute best performance attainable, a Positive and Negative pair may be installed right at each transducer rather than just before the crossover network after the binding post. Order Bybee Speaker Bullets online!